PurpleBox Audio Visual are committed to having a clear policy about your privacy and the way we use the data we collect from you. We make every effort to maintain the accuracy and completeness of your personal information. Please contact us if there are any changes to this information. Is your personal information disclosed to third parties? We use MailChimp to deliver our newsletter and company information via email. For more information, please see MailChimp's own privacy notice. When you visit our website we use a third party service, Google Analytics, to collect details of visitor behaviour patterns. We do this to find out information such as the number of visitors to various parts of the site. This information is only processed in a way which does not identify you. 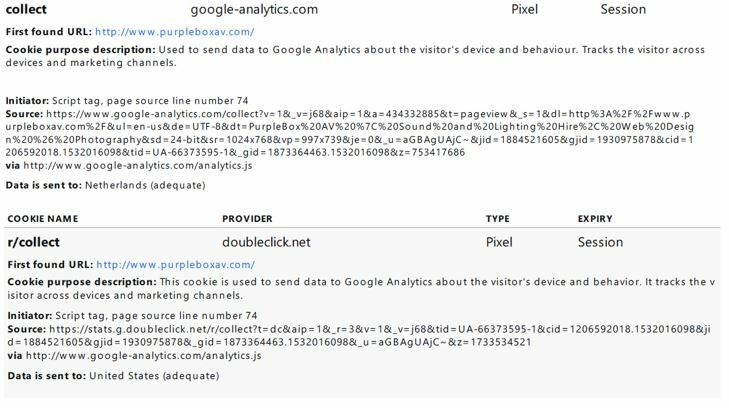 For more information you can read Google Analytics' GDPR compliance notice. We use Current RMS, Microsoft Office365 and Microsoft OneDrive to store your personal information in a controlled, secure environment, protected from unauthorised access, use or disclosure. Domains that we provide are registered with your name, address and contact details. Website Hosting and Domain Services are provided by GoDaddy. 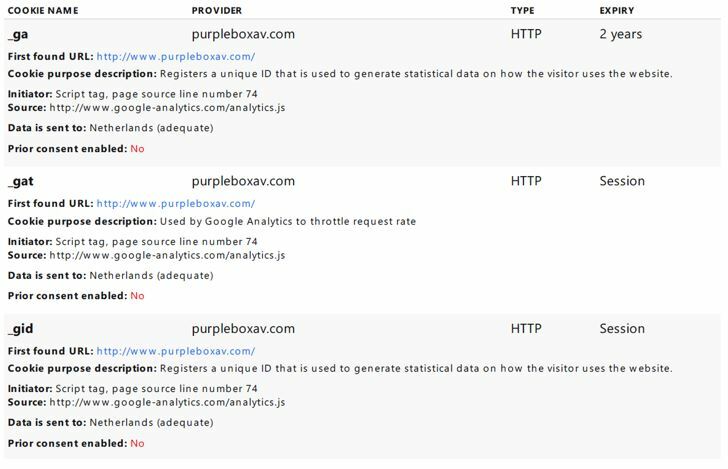 PurpleBox AV will not hold your personal information for any longer than is necessary. We retain personal information we collect from you where we have an ongoing legitimate business need to do so (for example, to provide you with a service you have requested or to comply with applicable legal, tax or accounting requirements). If you would like to exercise any of your rights please send a request, along with proof of ID to info@purpleboxav.com. We aim to respond to such requests within a month or less, although we reserve the right to extend this period for complex requests. These are cookies that are required for the operation of our website. They enable basic functions like page navigation and access to secure areas of the website. The website cannot function properly without these cookies.